Wheel Stops are a simple yet effective solution to protect vehicles and property from damage while they are being parked. These wheel stops will work in any type of car parking situation; they are tough, durable and unobtrusive, and come in rubber, concrete and steel versions. Contact our friendly and knowledgeable team at Bollard Shop in Brisbane or Perth for more information or enquire below by filling in the form. At Bollard Shop, we take the time to assess our customers’ needs to ensure that you walk away with a product that meets all your requirements. If you are looking for specialist, high-quality products, you can buy wheel stops online right here on this page; just select your product, add to your shopping cart and you’re good to go, and stop, safely. Alternatively, if you live in the WA region, visit our store in Rivervale, where we stock one of the largest collections of wheel stops in Perth. Rubber wheel stops are not only lighter than their concrete and steel counterparts, they are also hardy and more resistant to UV light. They can be painted with a yellow reflective paint, making them equally effective in the dark. This means they can be used in indoor and outdoor parking lots. Additionally, these parking wheel stops are light enough to be carried and installed by one person, their lighter weight also means their transportation costs are lower. Ideal wheel stoppers for cars. 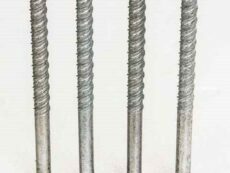 Concrete wheel stops are built according to all required standards and They are manufactured with compliance in mind; and will not fade, rust or wear. Essentially, they will last you a lifetime. They come in three standard colours, are exceptionally tough and can withstand all weather conditions and the hardest knocks. These products are galvanised, powder coated, and designed for longevity, and are mostly used in places that experience a lot of heavy duty traffic (factories or warehouses). 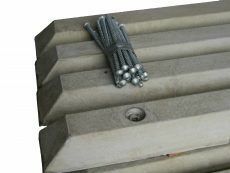 If you are looking for wheel stops made from concrete or rubber, contact us. We manufacture multiple products, and make some of the best wheel stops at our own factory in WA. 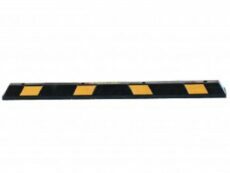 If you require simple, affordable and hardy products that will prevent damage to vehicles and structures, wheel stoppers are your ideal solution. 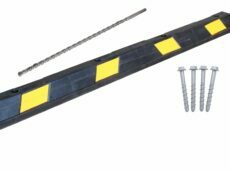 Contact Bollard Shop for all your wheel stop requirements, as well as a wide range of safety equipment. Heavy duty truck wheel stops are ideal where compliance is not necessary i.e. in private car parks, warehouse loading docks etc, where heavy vehicles are in motion. 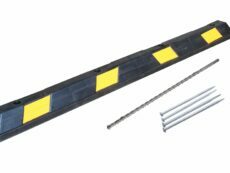 A heavy duty truck wheel stop is manufactured to be industry/purpose specific and is used to protect curbing and infrastructure from impact, along with vehicle paint work! 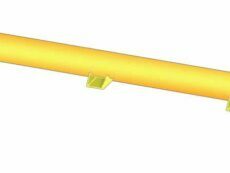 Our steel wheel stops are also electrostatically power coated in UV resistant safety yellow for outdoor durability.